Welcome to Page 2 of today's Colorado Beer News. Here's more of what's happening around the Colorado beerosphere today Monday, September 17th, 2012. More news being added to this page throughout the day til 3:00pm MDT. Grimm Brothers Brewhouse (Loveland) - It's back and by popular demand. Grimm Brothers is bringing back their Three Golden Hairs, a great Bohemian Pils that was a hit earlier this summer. It's back this Wednesday, October 19th. They don't know when they will bring it back again so get some while it lasts (limited quantity). Dry Dock Brewing Company (Aurora) - Fall is in the air and so are the aromas of Fall seasonal beers. You've waited all year for the Solstice Pumpkin Ale to come back. The wait is over! Pumpkin Ale will be on-tap starting Thursday, September 20th at 12:00pm! Crazy Mountain Brewing (Edwards) - Do ye be likin' some free beer matey? Arrr! 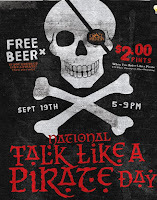 Well if ye do, dress up like a pirate (not the baseball kind) and head up to Crazy Mountain in Edwards, CO this Wednesday as they will be celebrating "National Talk Like A Pirate Day" on September 19th from 5pm to 9pm. If you show up lookin' like a pirate then yer 1st beer is free! (First beer only matey). After that if you order a beer talking like a Pirate each pint will just be $2.00. But we warned, if you order a beer like a scallywag then they're likes to charge ye $10 a pint (so don't be a scallywag). Ska Brewing Company (Durango) - Coming up this Friday, it's the first of 4 stout releases that will coincide with a Solstice or an Equinox. This first such beer will be their Autumnal Mole Stout. it's brewed with peppers, cocoa and spices. The release party starts on Friday at 5:00pm. Enjoy complimentary Birria, a spicy Mexican meat stew, a perfect pairing for the Mole stout. Listen to live music from D-Bes - a one man Ska/Reggae Band. Backcountry Pizza and Tap House (Boulder) - GABF week just got busier. Backcountry Pizza just announced three events coinciding with the GABF that you will want to check out. 1st, on Monday, October 8th at 5pm it's an Ommegang Mixer at 5pm. Sample Ommegang's Aphrodite, Gnommegand, Houghemont & Chocolate Indulgence. Food pairings also available. Then on Tuesday, October 9th at 5pm it's a Saison du Buff event. Try all 3 versions of Saison du Buff (Victory, Stone & Dogfish Head). Chris Cantrell from Stone Brewing will be on hand as well. Then on Wednesday, October 10th at 5pm it's a night of Special Tappings. They've been hoarding beer for this event and they'll be offerings you'll not want to miss. Backcountry Pizza is located at 2319 Arapahoe Avenue in Boulder, CO.